There are many options for accessories that go with your Kindle Paperwhite, including the many external accessories such as reading lights, styli, chargers, and more. You have plenty of options to choose from! Unlike previous models of Kindles, the e-ink screen on the Kindle Paperwhite has a built-in integrated light, so an external light source is not required for reading. However, a portable reading light continues to be a popular accessory. The variety of portable reading lights has boomed in recent years. If you opt to buy a light, the following suggestions will help you select the best one for your reading needs. A reading light needs a power source. Rechargeable lights tend to be lighter and more expensive than lights that use batteries. You can use rechargeable batteries in a battery-operated light, but you still have to contend with the added weight. When checking out battery-operated lights, determine what type of battery is required. AA or AAA batteries cost less but weigh more than more specialized disk batteries. No matter what sort of battery your light uses, always keep a spare set on hand. Another accessory option for Kindle Paperwhite owners is a stylus for the touchscreen. Why use a stylus? Some people prefer the more precise tip to tap the screen and menu options. A stylus can also keep the screen cleaner — no need to worry about dirt and oils on your fingers getting on the screen. If you’re searching for a stylus, look for one that is designed to be used with a capacitive screen. BoxWave makes a small bullet-style stylus with an attachment to hang on a keychain as well as a combo stylus with a ballpoint pen on one end and capacitive foam at the other. Amazon also sells a number of different styli at a variety of price points. Just search for Kindle stylus in the Kindle Store. Styli that work on the Kindle Fire (or other tablets) will work just fine on the Kindle Paperwhite. Unlike the Kindle Touch, which uses an infrared screen, the Kindle Paperwhite uses a capacitive screen. With an infrared screen, paired light beams and receptors sense when a finger, a stylus, or another object touches the screen and interrupts the light beam. The touch triggers an action, such as turning the page. Capacitive screens work with only a bare finger or a capacitive stylus. A capacitive screen uses a conductive layer on the underside of the screen through which a small amount of electricity flows. A touch on the screen causes a change in capacitance, which causes the desired action — usually turning the page on the Kindle Paperwhite. Although a stylus will work on a capacitive screen, a gloved finger will not. While the Kindle Paperwhite (second-generation) is advertised as having a very long battery life — up to two months if you only read 30 minutes per day with minimal wireless use and the light set at 10— it still needs to be charged periodically. The device ships with a USB cable which can be used for charging via a laptop or computer. Simply connect the USB cable to the Paperwhite and then connect to the computer. The first-generation Kindle Paperwhite battery life can last up to two months if you only read 30 minutes per day with the wireless off. If you want to read the device while it is charging, eject it from the computer (but leave it physically attached). The device doesn’t ship with a plug adapter, but you can purchase one from Amazon for $9.99 (5 watts) or $19.99 (9 watts) or use one from an earlier model Kindle (Kindle 2 or Kindle Keyboard). You can also use a mini-USB plug adapter from another device, such as a Blackberry. The 9-watt charger is designed for the Kindle Fire but is approved for use in the Kindle Paperwhite. 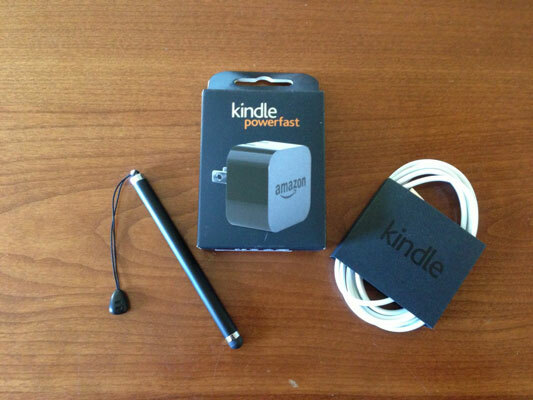 If you use this charger, the Kindle Paperwhite will charge completely in four hours or less. Although the cable alone is sufficient, having a backup is a good idea, especially if you’re prone to misplacing things. The complete unit — cable and plug — costs $25. The cable alone is $10. Amazon sells plug adapters that work in the United Kingdom (Type G, UK), the European Union (EU Universal), and Australia (Type I, AU). If you regularly travel to any of these countries, buying an adapter specific for that region might be a worthwhile investment. If you spend a lot of time in your car, consider a charger that plugs into the vehicle’s power source/cigarette lighter. A variety of adapters that work with the Kindle Paperwhite are sold on Amazon. Although the Kindle Paperwhite is light and easy to hold, sometimes you want to have your hands free while reading. In that case, you might find a stand to be a useful accessory. Amazon makes a basic minitravel stand that folds up and snaps shut when not in use. It’s made of black plastic with rubber coated ends for stability. BoxWave has two versions of easel-type bamboo devices: the stand and the panel. The stand is small, lightweight, and portable, whereas the panel separates into two pieces for storage. Note that BoxWave ships worldwide. The Peeramid Pillow was designed by two sisters who wanted to bring comfortable reading to the world. Place the pyramid-shaped pillow on your lap, and fit the Kindle Paperwhite in the lip at the bottom of the pillow. When not in use, the pillow can be disguised as a traditional throw cushion on a couch. Peeramid Pillows are sold in a variety of colors and fabric designs at Amazon (search for Peeramid Pillow).